“Mix water and flour with a little yeast and incubate the dough in a warm place until its volume has approximately doubled“ – such household baking instructions will (or may not) produce a decent result, but are not what is needed in industry. 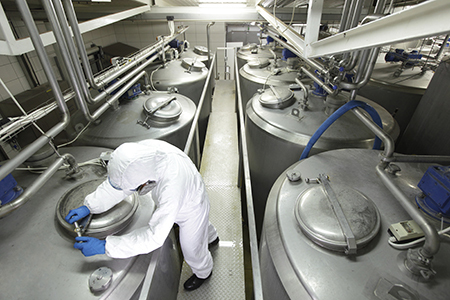 Bioprocess engineers in the food and feed industry carefully optimize producer strains and process conditions to manufacture products of high and consistent quality in an economical way. The ability to monitor and control critical process parameters is a prerequisite. Which strain is best? What temperature is optimal? And what process run time? Bioreactors and fermentors are the cultivation system of choice when process conditions need to be monitored, controlled, and reproduced, either to optimize a production process or to mimic environmental factors in applied research. Bioprocessing has been used for decades for the industrial production of beverages and for the production and preservation of food and feed ingredients. While these applications are still crucial, new ones are being added, such as the production of new food and feed additives, functional foods and various types of novel foods. Many interventions are needed to improve product characteristics, ensure consistent quality, and reduce production costs: strain engineering, optimization of process parameters, handling of difficult process conditions, and more. There are many interesting examples in the literature of how researchers tackle the challenges in food and feed applications, both old and new. In this white paper we introduce several of them that provide valuable insights and ideas.